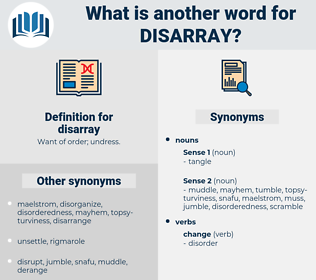 What is another word for disarray? dismay, distraction, clutter, havoc, helplessness, dislocation, disturbance, unrest, despair, breakdown. 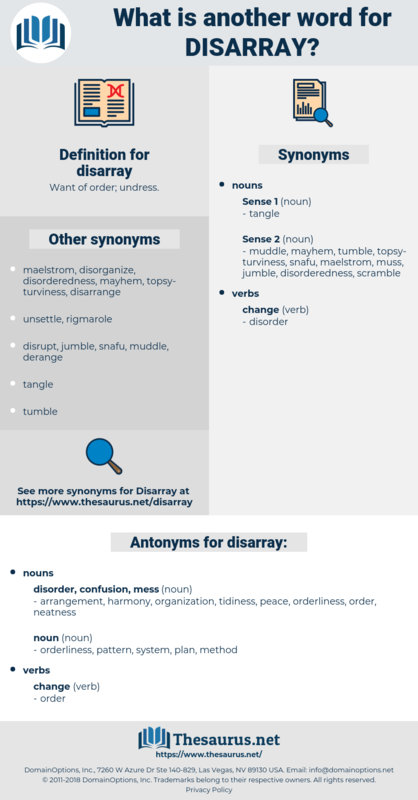 confusion, disorder, chaos, turmoil, disorganization, shambles, disruption, muddle, anarchy, mayhem, lawlessness, distress, desolation, commotion, mix-up, upheaval. neatness, orderliness, organization, harmony, peace, tidiness, arrangement. Contentedly Thryng proceeded to set his abode in order after the disarray of the morning, undisturbed by any question as to the equity of his deed. I have viewed, for example, Leicester Square between four and five of a summer morning, and have marvelled at its dismal disarray and quite miserable shabbiness of aspect. deicer, dysuria, dowser, De Saussure, de jure, digger, disk harrow, day care, Dies Irae, deck chair, descry, disc harrow, desire, dicker, dakar, dodger, due care, dicer, docker, dowager, dozer, dossier, daycare, disagree, dekker, decker, dagger, dog-ear, doojigger, dioscorea, degree, dishwasher, dasyure, disk error, dishware, decor, decry, decree, death chair, daiquiri, daguerre, dowitcher, dish washer, dosser. jumble, throw together, mess up, scramble, mess, perturb, derange, disarrange, throw out of kilter.